Our Lady of Czestochowa stood at the shore of the Pacific Ocean, symbolically beginning the pro-life pilgrimage "From Ocean to Ocean". Upon conclusion of the meetings in Vladivostok, Our Lady was given a sincere and emotional sendoff, with sorrow and tears at her departure, after the early morning liturgy on 15 June at the Orthodox Church of St. Nicholas. The Icon of Our Lady of Czestochowa continues the visit in Vladivostok on her pilgrimage through the world in defense of life. Now the icon is in the Cathedral of Our Lady of Care (Pokrowskij Sobor), where people continuously pray in front of her. 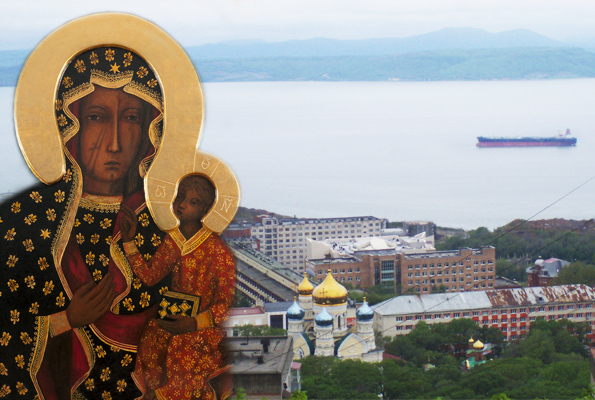 This is an historic moment, because the world pilgrimage of Our Lady starts in Vladivostok on the shores of the Pacific Ocean in the Far East. On June 2, the Icon of Our Lady of Czestochowa went by car from Moscow to the Far East. The first on the route was Kazakhstan. The Russians have bought a special van produced in Russia, which will cross the entire route from Moscow to Vladivostok through Kazakhstan where the official pilgrimage from the Pacific Ocean will start. On May 20, Orthodox defenders of life in Moscow organized a fourth car manifestation in defense of life "Stop Abortion". It was attended by hundreds of people and dozens of cars. The meeting began in the Orthodox Church of Annunciation of the Blessed Virgin Mary in the center of Moscow with a prayer before the peregrinating Czestochowa icon. On May 9, just before the International Day of the Family, Our Lady in her Czestochowa Icon arrived in Moscow, in her pilgrimage through the world in defense of life. She came from Minsk in the company of a Belarusian delegation led by Father Paul Serdiuk and Igor Beloborodov, coordinator of the Eastern part of the pilgrimage. 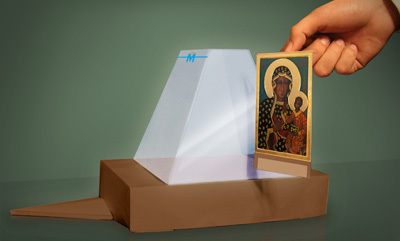 A Pilgrimage "From Ocean to Ocean" of Our Lady of Czestochowa in her icon will begin any time. Now we have to decide how she will travel. Through the Siberian wilderness we definitely need a pickup truck, which is currently prepared by Russia's pro-life leaders. We Poles however, want the icon to be clearly visible when driving through towns and villages, not enclosed in an armored box.